Romeo Miguel, recruiting operations officer; Maj. Steve Kwon. For those not familiar with Army ROTC, there may be a perception that officer training solely focuses on basic “Soldier skills,” such as marksmanship, land navigation and tactics. While Soldier skills are learned, leader development is not solely about learning tactical skills, but also about creating leaders who are open to new and often times uncomfortable experiences that challenge their way of thinking. One of the ways cadets are able to test themselves is through overseas training missions. The Cultural Understanding and Leadership Program (CU&LP) and Project Global Officer are two competitive programs that assist in this process. While Project Global Officer focuses on language training and earns participants college credits, CU&LP focuses less on language and more on learning to work with foreign militaries and organizations. Cadets who participated in the program consider it one of the best and most exciting summer programs that Army ROTC offers. Through the program, cadets have the incredible chance to travel the world, work with other countries’ militaries and immerse themselves in other cultures. The program is designed to help cadets understand the similarities and differences that exist between them and their host nation. They also learn how their actions affect those around them by conducting training alongside cadets from their host militaries, participating in humanitarian aid missions and traveling to important religious and cultural sites to better understand how history and religion have shaped the nation. Not only does this program provide priceless opportunities to the cadets on a personal level, but the Army benefits as well. The Army is making an investment in its future leaders by allowing them the opportunity to learn first-hand the importance of customs and culture in military operations and appreciate the world’s diversity. The CU&LP program is an eye-opening experience for any cadet with a passion to explore the world and a willingness to open their mind. Lieutenant Colonel Stambersky graduated from the University of Richmond in 1999 with a Bachelor’s Degree in Health and commissioned as a Quartermaster Officer. She later went on to earn Masters’ Degrees in National Security Studies from the Naval Postgraduate School in Monterey, California. Prior to her current duties, she served as the single Liaison Officer for the Defense Logistics Agency (DLA) to the Department of the Army at the Pentagon, Washington D.C. While at DLA, she also served in the Joint Logistics Operations Center providing actionable logistics analysis directly supporting the Joint Force as well as State and Federal Agencies as the Joint Strategic Distribution Officer. Lieutenant Colonel Stambersky currently serves as the Professor and Chair of the Department of Military Science at UCLA. Last summer she served as Mission Commander for a US Army Cadet Command sponsored Cultural Understanding and Leadership Program mission to Indonesia. In Indonesia, she led a team of over 30 cadets from around the nation to partner with the Indonesian Naval Academy, Technology School as well as participate in numerous outreach opportunities coordinated through the US Consulate in Surabaya in support of the State Department. 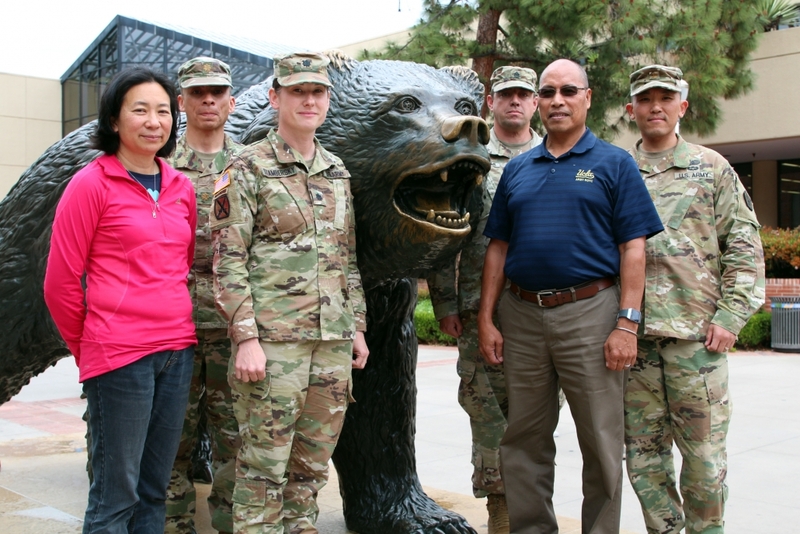 For more information on how you can join UCLA’s Army ROTC program and participate in numerous opportunities that will help develop you into a future leader of character for our Nation, contact our Recruiting Operations Officer at 310-825-7381 or armyrotc@milsci.ucla.edu. Lieutenant Colonel Stambersky and her colleagues from the UCLA ROTC program were recently featured in the news for their acts of heroism in which they rescued motorists from a major crash on a Los Angeles freeway. To read more, click HERE.